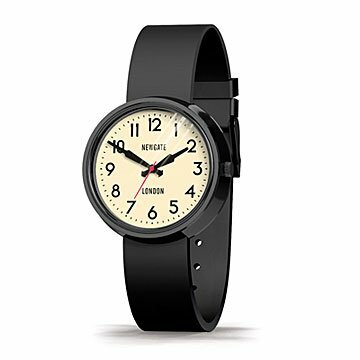 Sport a modern classic with this wearable, unisex version of Newgate's iconic wall clock. Sport a modern classic with this wearable version of Newgate's iconic wall clock. The charmingly chunky timepiece features a midcentury modern face with bold, sans serif numbers and a sweeping red second hand, all characteristic of the British clock makers' retro-inspired style. The supple silicone straps are cleverly hinged under the case, so there's no need for protruding lugs to interrupt the arc of the unisex design. Desinged in England; made in China.